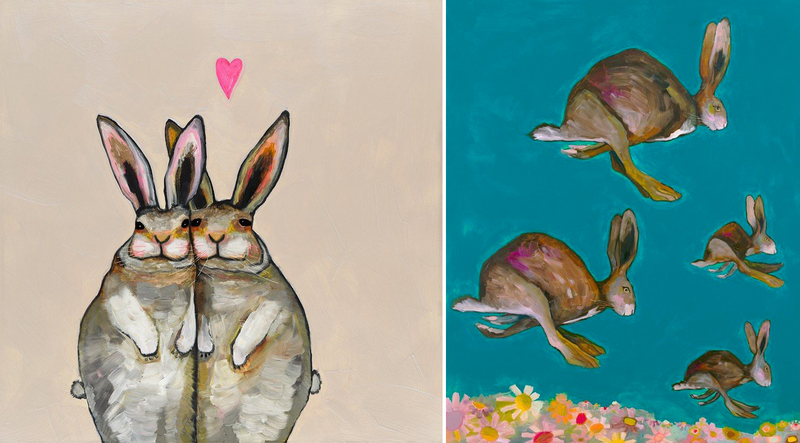 Playfully Painted Portraits of Colorful Animal Characters. Stylized Oil Painting to Depict Unique Faces of Creatures. The goal of most portraiture is not to simply copy the exact likeness of your subject, but rather to represent the unique character. Austin based oil painter Eli Halpin has developed a beautiful style of depicting animals full of personality and playfulness. She speaks of imbuing humor and romance in each piece, and I'd argue that she's wildly successful! 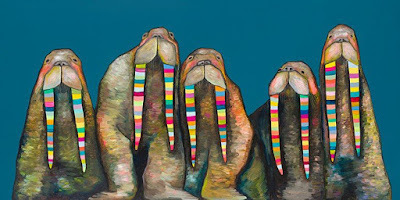 Her paintings usually feature one or two creatures and sometimes a whole pack. These works are always rendered in a bright array of hues with what I'd guess is a more impressionist inspired style of shading than most contemporary oil painters. Blocks, dots and swirls of often unexpected color give her animals form and contour which adds a lot of whimsy. This is also my favorite element of her style because it rewards the viewer for taking a closer look and gets you wondering how our eyes trick us into seeing a blend from farther away. 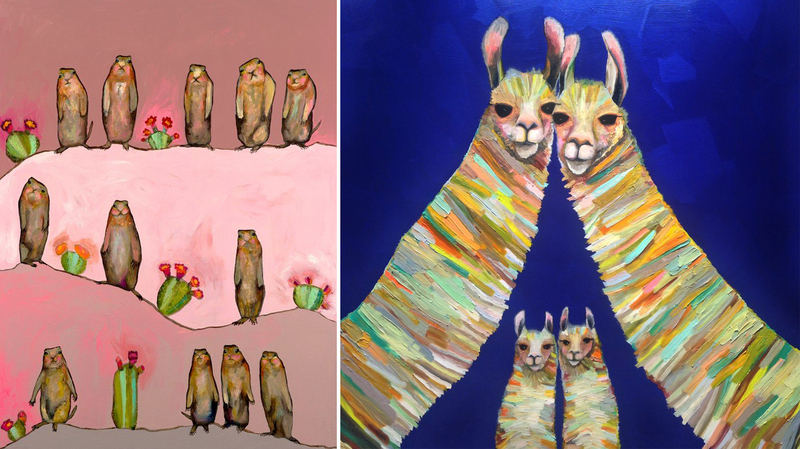 Eli's focus on her paintings is first and foremost to highlight the facial characteristics of anything from a llama to a bear to a fish. The backgrounds are often simple, perhaps a single color or one key element of the surroundings so your eyes are drawn to the fun fauna. Eli does a lovely job with detail so you can see the personality through her animals eyes and other features. Some of Eli's pieces incorporate more than just oils as an experiment in adding depth and effect with 3 dimensions. It adds a unique touch for sure! Out of her collection, those that speak to me most are the animal duos and "family" portraits, giving a human nature to their relationships and expressions of affection. I think many of us would share the reaction of "how cute" and then as you look deeper you can see the skill and technique inherent in Eli's characteristic style!